Digital Media marketing is becoming a base business function. But just like putting a sign above the entrance, it cannot stand alone. Nielsen Research found, in March 2017, that more than another other traditional media, Digital marketing became more effective when teamed up with Billboards/Out of Home. Nearly 5 out of 10 US Adults used a search engine to look up information after seeing or hearing about the subject in an Out of Home Ad. When comparing online activations, triggered by various media and the dollars spent, Out of Home media is, by far, the leader in reinforcing and growing the effectiveness of your digital marketing. 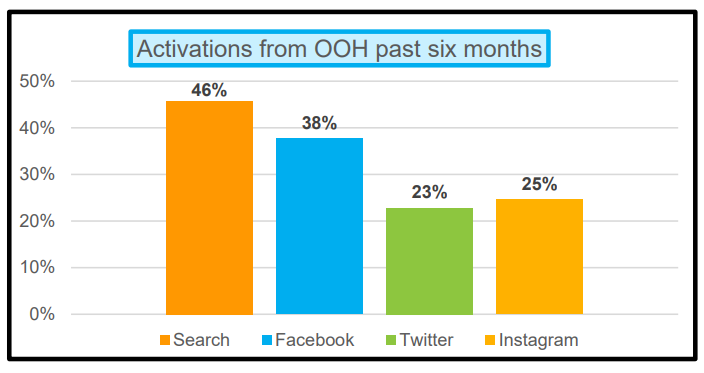 OOH is more than three times more effective when driving the results of digital media.